Curvices (2013) is a digital application, a virtual poetry and sound installation for cell phones, that accompanies you on your walk through the museum park Klankenbos/ Sound Forest in Neerpelt, Belgium. By changing location you codetermine the development of the music and the poetry. Where are you? What do you hear? Is it indigenous birds that are singing in the forest or do you hear birds from Portugal through your cell phone? Is it a siren you hear or is it the wind? By exploring the terrain you probe sounds and words, you make a journey through the forest, around the world, in as many steps as you like. The composition Curvices (2013) is composed by Rozalie Hirs on the basis of her bibliophile poetry collection Curvices and Musicles (Bleiswijk: Studio 3005, 2013). The book is designed, set, and hand printed by Marc Vleugels. 23 November 2013, 15:00 CET, Official opening with a guided tour and lecture by Rozalie Hirs, Cox & Grusenmeyer, and Yvan Vander Sanden. From 23 November 2013 onwards the installation is permanently accessible to the public, and free of entrance fee. The Curvices sound and poetry app (2013) is available as a free download through scanning the below QR code. Please note that the Curvices app is location specific, hence it only works when actually present at Klankenbos/ Sound Forest, Neerpelt, Belgium. Commissioned by Klankenbos / Musica, Neerpelt, Belgium. With financial support from a Composition Stipend 2012-2013 from Fonds Podiumkunsten. In collaboration with Wiek Hijmans (electric guitar), Patricio Wang (bass guitar), Martín Ibarburu (drums), Carlos Dalla-Fiore (mixing, mastering), Matthijs de Valk (technical assistance). Special thanks to Magnus Robb for giving permission for the use of his bird song recordings. 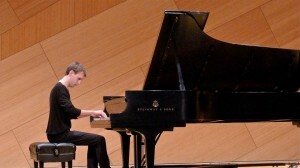 On 15 May 2014 Todd Moellenberg plays a solo recital at UCSD, University of California San Diego. He performs the composition article 1 to 3 [the] [aleph] [a] (2003) by Rozalie Hirs, and works by Katharina Rosenberger, Pierre Boulez, and Olivier Messiaen. The composition is part of the solo CD Ladder of Escape 11 (Amsterdam: Attacca Publishing, 2014) by Fie Schouten. The string quartet Zenit (2010) consists of four movements which are [north], [east], [south], and [west]. All movements investigate the overtone realm of the string quartet. Zenit is scored for a relatively high register of the string instruments with a quick highly energetic bowing technique, resulting in a continuum between timbre, tone color, and harmony, pitch. In [north] each of its twenty constituent chords are articulated in a distinctly different way, the rests can be regarded as inhabited by inaudible harmonic progressions. In the [south] movement, clouds of tones are separated by shorter silences. In [east] several possibilities of harmonic movement are investigated in one continuous movement. In [west] a delicate web of harmonics is spun, and then unraveled through glissandi of harmonics like light falling onto the audience. An earlier version of this string quartet is Zenit, uur nul (2007), which was commissioned by Zephyrkwartet, with financial support of the Netherlands Performing Arts Fund. Hirs used some of its material, yet thoroughly rewrote the entire piece. As a consequence, Zenit, uur nul was removed from the catalogue of the composer. It bears mentioning that without Zenit, uur nul (2007) the new string quartet Zenit (2010) would have not come about in is present form. Therefore, Hirs is deeply grateful to the players of the former Zephyrkwartet: John Addison, Elisabeth Smalt, Barbara Lüneburg, Jacob Plooij. Zenit is dedicated to Mark Menzies and Formalist Quartet. The rare outing for Les Espaces Acoustiques invites a consideration of Grisey’s influence on modern music. And Saturday night, CalArts presented a marathon concert that continued on into Sunday morning titled “New Music After Grisey.” Grisey died at 52 in 1998, and the concert was really an evening of strange sounds that preceded him, coexisted with him and have continued in his wake. For a long time, Spectralism pitted Europeans against Americans. Our Minimalists charged ahead with a horizontal approach to music based on rhythm and repetition. The French Spectralists – who influenced such Finnish composers as Kaija Saariaho and Magnus Lindberg as well as a number of German, Austrian and British composers — were builders of harmony and sonority who thought vertically. Saturday’s concert presented a more complex picture. If we accept Grisey’s speculation that sound is a living organism, then Spectralism is virus that infected composers’ thinking about sound in any number of individual ways. None of the 10 works Saturday resembled any other. The earliest score, by the late American experimental composer James Tenney, Clang, is from 1972 and pre-dated any work in French sound labs but was the most magnificently “spectral” of all. Clang, 15 minutes of glorious ground-shaking and ground-swelling overtone, was played at the midnight hour by the CalArts Orchestra to conclude the concert. Performances of the brilliant score are as rare and special as those of Grisey’s much larger project. At the other end of history came the world premiere of Rozalie Hirs’ engrossing string quartet, Zenit, played by the superb new L.A.-based Formalist Quartet. Everything I might say about Hirs’ unsettled music I could also say the opposite. It is also quite settled. It forges ahead with tentative sounds and silences. It stops and starts yet flows. It has a hint of hard-hitting Dutch Minimalism, yet it offers a feast of radiant string harmonics, pulsating outside of rhythm. 28 September 2013, 20:15 Zenit [west], Amsterdam Sinfonietta Anniversary concert, Muziekgebouw aan’t IJ, Amsterdam, The Netherlands – Amsterdam Sinfonietta & Candida Thompson. 16 September 2012, 16:00 Zenit, Moments musicaux III, Aarau, Switzerland – Quatuor Bozzini. Swiss premiere. 29 November 2011, 20:00, Zenit, Chapelle historique du Bon-Pasteur, Montréal, Québec, Canada – Quatuor Bozzini. Canadian premiere. 20 November 2011, 14:00, Zenit, Huddersfield Contemporary Music Festival, St. Peter’s Church, Huddersfield, England – Quatuor Bozzini.UK premiere. 11 November 2011, 12:30, Zenit, November Music 2011, MC De Toonzaal, Den Bosch, Netherlands – Quatuor Bozzini. 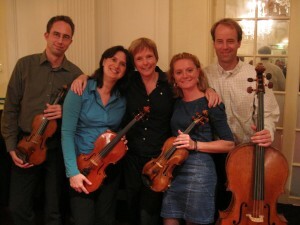 18 October 2011, 20:00, Zenit, De Link, Tilburg, The Netherlands – Quatuor Bozzini. Netherlands premiere. 24 September 2010, 16:00, Zenit [east] & [west], Klank en kleur Festival: Confrontaties, AAA Concertgebouw series, Spiegelzaal, Concertgebouw, Amsterdam, The Netherlands – Egmont Kwartet/soloists of the Concertgebouw Orchestra (Eke van Spiegel, Arndt Auhagen – violin; Edith van Moergastel – viola; Fred Edelen – cello). Netherlands premiere of the two movements [east] & [west]. 1 May 2010, 20:30, Zenit, Les espaces acoustiques and beyond: New music after Gérard Grisey, REDCAT, Roy and Edna Disney/CalArts Theatre, Los Angeles, United States – formalist quartet. World premiere. Rozalie Hirs with the players of the Egmont Kwartet after the performance of Zenit (2010) during the AAA serie, Concertgebouw, Amsterdam, The Netherlands, 25 September 2010. Location: Les espaces acoustiques and beyond: new music after Gérard Grisey, REDCAT, Roy and Edna Disney/CalArts Theatre, 631 West 2nd Street, Los Angeles, United States. Zenit was selected for Toonzetters 2011 as "one of the ten most beautiful works of the previous year". Location: Muziekgebouw aan't IJ, Piet Heinkade 5, Amsterdam, The Netherlands. Performers: Susan Narucki, Pierre-André Valade, Asko|Schönberg. And the mill keeps turning many a poem long, the words keep on coming, the words are streaming. A stormy homecoming. Technically, she achieves this word-stream effect by eliding the punctuation marks (consistently every poem starts with a capital, surely a detail, but indicative of a striking meticulousness). Ever since Apollinaire this technique is an old trick but it works. Sentences seem to form bridges across each other, to overcome one another, to be ahead of each other, to inflate one another. This way poems appear that are chock full of anacolutha: a deconstructive stylistic device that is being used throughout the collection and that, as has been mentioned, keeps its effect of surprise. Geluksbrenger is divided into four cycles, distinguishable from each other in their visual design, but stylistically connected by minimal repetitions and subtly recurring motives that are confronted with different contexts. The visual design changes gradually from cycle to cycle: one notes a shift from compact blocks of prose-like text to a typography that branches out all over the page, eventually coming back to density in the final poem of the last cycle – called, probably not by coincidence, ‘In één adem’, ‘In one breath’. Something has set the cycles structurally (and physically) in motion: it is as if, all through the collection, the poet has been inhaling deeply. In 2006, visual artist/new media artist Harm van den Dorpel collaborated with Rozalie Hirs in the second installment of Poëzie op het Scherm (Poetry on Screen), an initiative by the Dutch Foundation for Literature. At the official presentation at De Waag, Amsterdam, May 17, 2006, Hirs and Van den Dorpel presented two interactive poetry applications: Stamboom (click the icon under the poem to open the digital app), and Tekstverschijning. When the collection Geluksbrenger (Amsterdam: Querido, 2008), of which these two poems were part, was sold out, the duo decided to offer the entire collection online. Harm van den Dorpel chose to work within an html environment, within which he developed all programs for the applications by himself. On February 11, 2011, Geluksbrenger online was released with poems, recordings and music (listening spaces, spoken word, and musical pieces with text) by Rozalie Hirs, and interactive poetry applications developed by Harm van den Dorpel.